Never has a youngster sat down to play with a pile of plastic building blocks without imagining just how incredibly awesome it would be to actually live inside one of their colorful-brick creations. Well, here's a hermit crab who did just that, no assembly required. 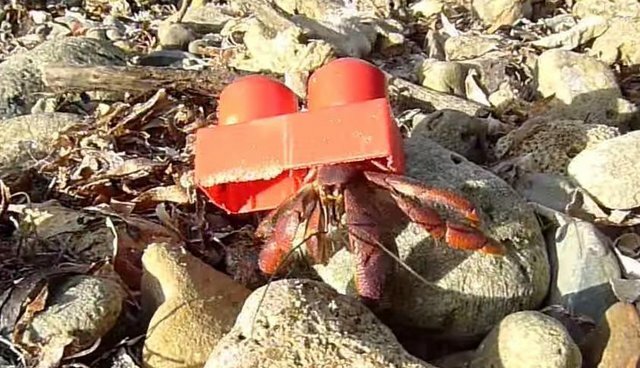 It's unclear if the hermit crab chose to take up residence inside the large Lego-like block because there weren't vacant shells available, or if he believed it would offer superior protection - but he certainly does look cozy in his little duplex. Chances are, however, that it won't be his home for too long. As hermit crabs begin to outgrow their living quarters, it's essential that they find new ones. Sometimes, finding a shell (or shell-like object) that will fit them is no easy task, in which case they team up for adorable house-swapping parties. We already envy whoever winds up taking over this hermit crab's building block home when he's done with it.